The Johns Hopkins ABX guide is my go-to “bug” guide. Although it utilizes the same Infectious Disease Society of America (IDSA) treatment recommendations as the Sanford Guide, I find its user interface more elegant and efficient. 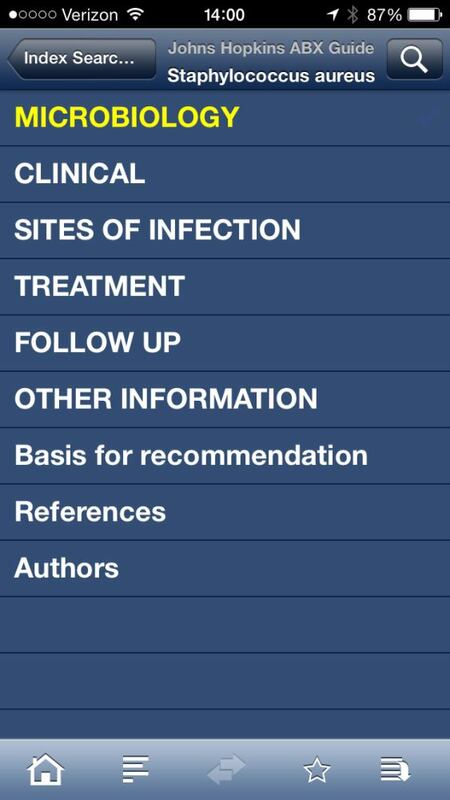 By the time the Sanford Guide “loads”, I can already be reading antibiotic recommendations in the Hopkins app. Furthermore, Hopkins gives more detailed information about the disease itself, from signs and symptoms to lab information. 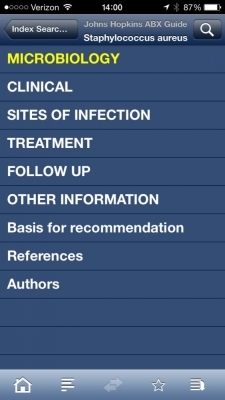 The app also provides detailed information on antibiotics, antivirals, etc. that are typically only found in pharmacy textbooks. This information is very useful and frequently eliminates the need for me to look up more about a particular condition or treatment in UpToDate, Dynamed or Lexi-Comp.